Winslow Reef has come and gone and what an amazing place it was. Using CHIRP we found a steep rise starting at about 3000m and shooting up to 40m. We then found a plateau of about 50 feet and snooped around until we found a nice sandy patch to anchor in. The winds were calm and there was a gently rolling swell. and the sunset through the rigging at the end of a successful search for an elusive reef. Once the anchor was down and the sun was set did it sink in what we had accomplished. We had successfully found and anchored on a reef that was first reported in the 1800s by Captain Winslow of the whaling ship Phoenix and last confirmed in the mid-1900s. All accounts of the reef had listed different coordinates, and some were off by 90 miles. Some listed breaking waves, others 11m of depth, and some warning of two brown rocks. We were anchored in the middle of the ocean, not a spec of land for 100 miles in any direction. If it had been a cloudy or windy day, we probably couldn’t have seen the flat reef below us, and if we hadn’t had CHIRP to guide us, we probably wouldn’t have found it at all. There we were, anchored in a spot that likely no one else has ever been anchored in, looking down on reefs that the scientific community knows nothing about. In the morning, we ran 4 rounds of snorkel expeditions for students and crew alike to get in the water in this elusive place. We took pictures to document the reef community, oogled over the wildlife, and all got back aboard safely. The WHOI scientists, who we affectionately call the Tweedles (jury is still out on which is Tweedle Dee and which is Tweedle Dum..) Went on two shark cataloging missions and on the way back from their second one, towed our fishing lines through two bait balls. They came back with two Wahoo and two tuna! 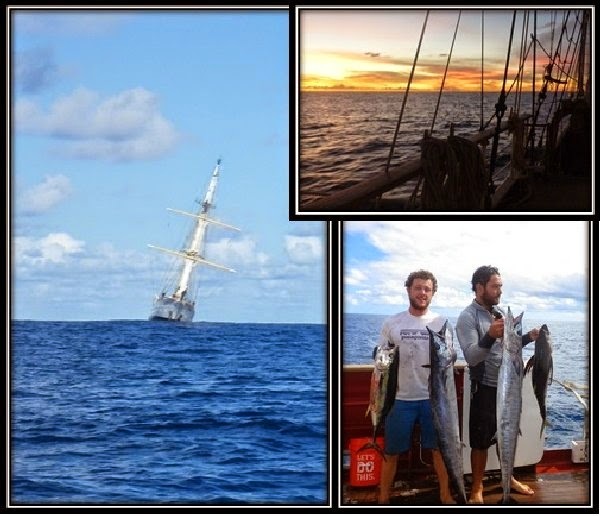 Once underway, we took the Seamans through a bait ball and caught four more fish! We released them, already overjoyed with the previous catch. These waters are SO productive and rich with life. Today (Aug 1), we awoke to find that the wind had left us. Motor-sailing until our morning science station, we were like a painted ship upon a painted ocean, and you could see the reflections of the clouds clearly in the water. After our daily class, we were told by Captain Pamela that these conditions were ideal for a swim call! We all got in out bathing suits and got cool and clean in the big blue. Just when I thought things couldn’t get any better, Nina served us ice cream!!! Even though August first is arguably the beginning of the end of summer, it feels far away from us here.